About the José de Sousa, which has a rating of 93 points, Wine Enthusiast highlights: “this rich, full wine is firmly anchored in ripe tannins. It has concentration and a dense texture layered with black fruits and acidity. Partly fermented in clay amphoras, the wine has a particularly juicy edge as well as freshness”. Finally, the Puro Talha 2015, with 92 points is a wine “Fermented in a clay amphora and then aged partly in wood, this fascinating wine is packed with fruit. It has a richer character than its alcohol would suggest, dense and ripe but with only the lightest of tannins.”. 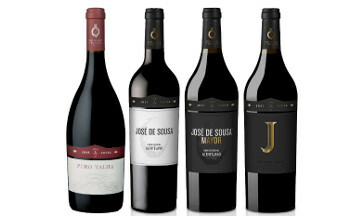 This range of wines aims to continue the heritage of the Tinto Velho José de Sousa 1940, a mythic wine of the Alentejo. The wine production at the José de Sousa winery dates back to 1878 and the basis of the wine profile relies on the ancient and rare vinification using clay amphorae. The acquisition of this winery in 1986 by the Soares Franco family, enabled important investments in the recovery of the clay pot vinification and providing a new life to one of the oldest and most prestigious wineries in the Alentejo.